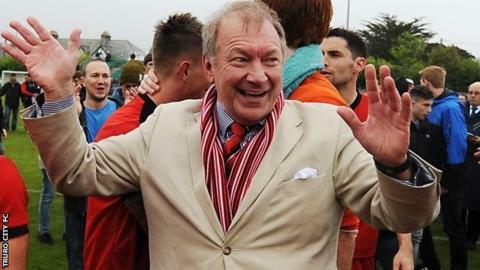 Truro City chairman Peter Masters says the club will need to almost double its attendances if they win promotion from National League South. The Cornish side were beaten 3-1 by strugglers Weston-super-Mare on Tuesday in-front of 472 supporters. However, they remain in the play-off places, three points clear of sixth-placed Maidenhead United. "We need at least 800 because that's the sort of crowds we'll need if we get in the National League." said Masters. "I won't be disappointed if we just reach the play-offs - we've had a good season, we can't argue about that." Truro, managed by Steve Tully, were two goals down before on-loan striker Matt Jay pulled one back, but Weston-super-Mare scored another to seal the win. The highest crowd at Treyew Road this season was 785 against Ebbsfleet in February. The White Tigers host fellow play-off hopefuls Maidstone on Saturday and Masters told BBC Radio Cornwall: "We're hoping for a very big crowd. "I think last week Maidstone picked up a crowd of nearly 3,000 - if we can get even 800 we'd be grateful."